Louis Sulit researches gene expression within human cancer cells. Louis Sulit doesn’t know how to shy away from a challenge. Earlier this month, he graduated from UNCG with a bachelor’s degree in biology and full university honors. He’s spent the last four years of his life pursuing excellence. 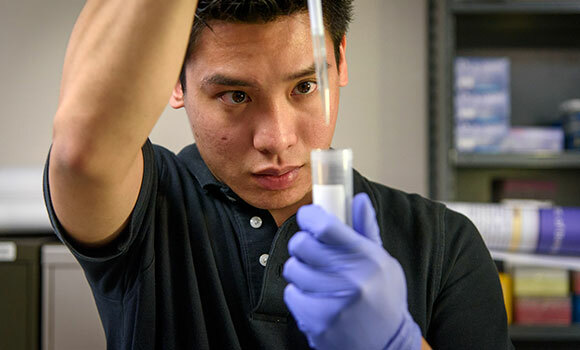 From study abroad to undergraduate research, his hard work and dedication have paid off. After all, his last name means “worth it” in the Filipino language Tagalog. Sulit, a first generation American born to Filipino parents, applied to several public universities across the state, but he says it was the Lloyd International Honors College that set UNCG apart from the others. He’s always excelled academically, so the honors college was the perfect fit. Sulit opted to live in an honors residence hall, a defining factor in his experience at UNCG. The honors dorm provided a tightknit community where Sulit was inspired and encouraged. “I made a lot of friends. Although I was away from home, I still had a family,” he said. The Honors College’s impact on Sulit’s experience extended beyond the dorm, however. Sulit spent two semesters working under Associate Professor of Biology Dr. Karen Katula studying gene expression within human cancer cells. His focus on bioinformatics provided hands-on experience in UNCG’s biology lab working on real, impactful research. Sulit presented his research at the North Carolina Academy of Science and the UNCG Undergraduate and Creativity Expo. He won second place in science at the expo. He also spent a semester studying abroad at Plymouth University in Plymouth, England through the Lloyd International Honors College. “In my group of friends, I was the only American. It was like seeing the world from a different point of view,” he said. That global perspective has been valuable as he’s served residents in Greensboro’s Glen Haven community. Teen Time, Sulit’s culminating project for UNCG’s Leadership Challenge Program, provided fun, extracurricular activities for refugee teenagers, as well as guidance about life in America from college students. “We helped them adjust,” he said. Sulit hasn’t finished taking on big challenges. After a gap year focused on building his resume in the health care field, he plans to apply for medical school in Las Vegas to continue his ultimate goal of becoming a doctor. Medical school will undoubtedly bring its own set of challenges, but Sulit said he’s confident it, like all his experiences at UNCG, will be worth it. Story by Jeanie McDowell, University Relations. Photography by Martin W. Kane, University Relations.